Today's San-X character that I chose was Tsuginohi Kerori. As you can see I colored my rice again because I need to make two colors Kerori. For the light green rice, I mixed rice with blended edamame. I put some salts into the rice-edamame mixing, and my kids love it. I bought some plastic glasses with San-X characters last week. And one of them was Kerori. I just put it on the back in this picture. TSUGINOHI KERORI can change colors to green or white depending on his mood. He turns green when he is sad and turns white when his happy. Inside the box : fishballs & carrots, baby corns, stir fry soya ginger chicken, sweetened red cherries, steamed baby corns, takuwan falling stars and flower shapes carrots. And I would like to thank Sheri that has given me an award. I feel honored to receive it. Thanks for being such a good bento buddy all this time. Sheri is a great bento maker. All her bento are colorful, cute, and pretty. I learned a lot from her. You can visit her blog at Happy Little Bento. The hard part of passing the award is that I want to give it to every blogger friends, but I should not greedy and should play by rule. Only one friend at the time, I am sure we will be having fun passing this award. So I choose Jenn from Bento for Kidlet. Jenn is also a great bento maker. She is so good with all his cheese drawings and checkered apple. She is a loving mom who always prepares bento for his son. You are such a master at these characters. So cute. ha...haa...this is so fun...can change colors?? Really cute! @Anncoo : Yup, I just found out too that Kerori can change colors ;) Thanks Anncoo for your sweet comment as always! Hi Lia! Soo adorable Kerori! Great idea to use leaf picks and teddy shape too. 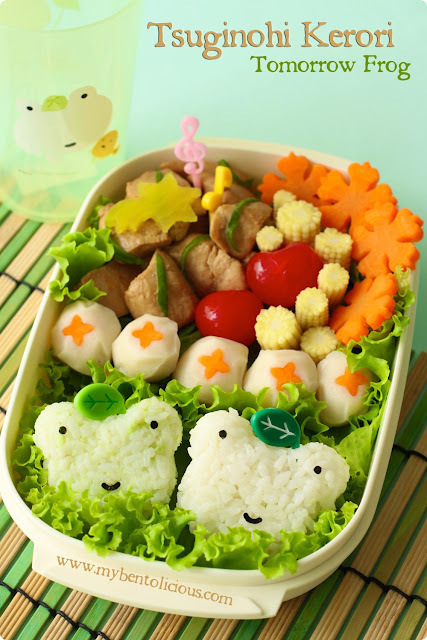 Always creative touches in your lovely bento!! Aww I love these San-X characters you are making they are so adorable! I forgot to mention, you got a new flower cutter? It's soo interesting with the curvy petal shape! Very unique! @sherimiya : Sheri, sorry for the late reply here! You have seen it on my Twitter. @Angi : Thanks a lot Angi!